Getting ready for next season? Want to get a head start? then come to the Sun in Italy! There are organised and coached swim, run and cycle sessions every day. ALL standards are catered for. In our group, there are a lot of experienced coaches and experienced athletes to help you sort out your own particular best programme. Every previous camp held has included and catered for standards ranging from absolute beginners right through to experienced Internationals. Flying time is approximately 2 hours. Dublin: Ryanair departs 19.25pm arrives 23.10pm. Costs for those booking their own flights on these or other flights; please deduct £165 from price. Let Steve know by e-mail if you are doing this. Please do compare the cost to other warm weather training camps and see what is and isn’t included. If you want to hire a racing bike in Cesenatico, the cost will be added to your room/drinks bill direct. Please let me know when you book if you require bike carriage. We believe that the price knocks spots off of just about every other warm weather camp out there. The camp price includes all flights and transfers, and all meals except lunch. There are several other training camps where the price doesn’t include one or both of these. Please, please do compare and see what there is out there. With BA’s charge for bike carriage (see prices above). You may wish to consider hiring a bike through Dante Delvecchio (hotel owner) while we are there. I have done this for a few years now. Cost is around E100 for one week. Air travel out of Heathrow and into Bologna International airport. Accommodation in twin-bedded room; there are a LIMITED number of single rooms, supplement is around E15 per night, please let me know EARLY if you want a single room. The Nove Colli cycle event takes place on Sunday May 19th. Entry will be arranged by Dante Delvecchio. This will be added to your room bill. Always make sure you have a drinking bottle. The weather has always been kind to us on previous camps; however remember that there can be showers and it is as well to bring along at least a rainproof cycle jacket. Normal training gear is best; for swimming please bring a pull buoy, paddles – remember goggles! Crash hat is essential, hand mitts advisable. Questions? Ask! 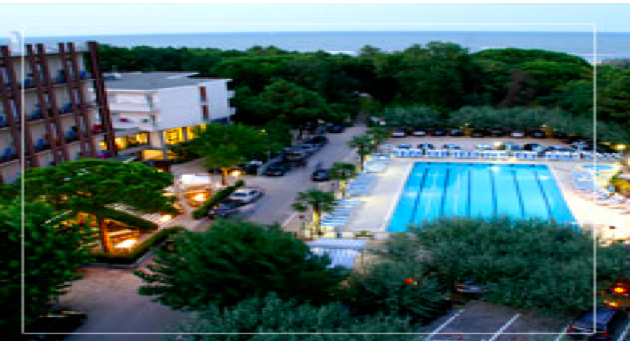 Hotel on left, our swimming pool right centre, woods and sea in background………. Couldn’t get the nine hills cycle in! a typical day goes something like this…….. There is always somebody to train with at your standard. If you are interested or want to have a chat then just pick up the phone and ring Steve Trew on 0208 886 5175. Preferred 2nd option return flight? Early morning or evening? As your deposit will be used to book flights and these are non-changeable, there is unlikely to be any refund of deposit if you decide at a later stage not to go on the camp. I understand that the organisers cannot accept any liability for any injuries howsoever caused, nor for non-availability of any stated facilities or changes in the training programme. Best times. Please give some info, and state distances if not shown below. or, I couldn’t care less who I share with ‘cause I’ll be too shattered to care!!!! !